Put out some fires with this fun Fire Truck Collage. 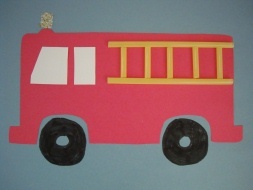 This easy firetruck craft for kids is made with simple craft supplies found around the house or classroom! Perfect for preschoolers on up! 2. Use straws to make the ladder. Cut two long pieces for the sides, and small pieces for the rungs. Glue in place on your fire truck. 3. Glue something glittery to the top of the truck for the flashing light. We used a glittery pom pom, you can also use a few sequins or glitter glue. 4. Now it's time to paint on the wheels with black paint! If you don't want to use paint in your collage you can also cut wheels from black paper to stick on, or you can buy self-adhesive foam and just stick the wheels on!